It's almost summer which means we have lots of vegetables and we need something to do with all of them. By something I mean anything other than what we usually do to them. Boiled green beans, no more! It's time for you to try roasting them. This isn't anything like tortilla chips and queso, but it's freakin' delicious even so. I love a cheesy chip situation like the rest of us, but sometimes it's a little counterintuitive to actually, you know, eating healthy? So a sprinkle of pecorino romano is the compromise here. Ok, I couldn't help myself so there's also a roasted red onion yogurt sauce to dip 'em in. I didn't say I was perfect, but roasted green beans will be your favorite side dish before you know it. I can promise you that. Toss together the green beans with the garlic and a drizzle of olive oil on a parchment-lined baking sheet. Add the red onion and lemon wedges on the side. Roast the green beans, red onion and lemon in the oven for 25 minutes until the green beans are slightly wrinkled. You’ll want to give everything a stir halfway through. To make the red onion yogurt sauce, add the greek yogurt, capers and dijon mustard in a food processor with the roasted red onions. Squeeze the roasted lemon juice into the food processor as well. Whiz everything together until the red onion breaks down and everything is combined. Taste and add salt and pepper if desired. 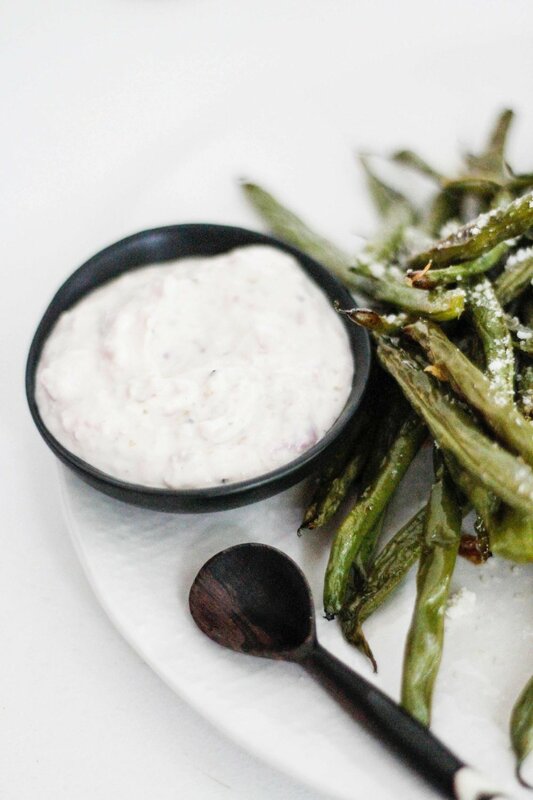 Serve the green beans with a generous sprinkle of grated pecorino romano and the red onion yogurt on the side.